Stock market leverage is the big accelerator on the way up, when people and institutions borrow money to buy stocks. And it’s the big accelerator on the way down when margin calls and other financial pressures turn these investors into forced sellers. The money from the proceeds of those stock sales doesn’t then sit on the sidelines or go into other stock purchases; no, it is used to pay down that debt. And these much-hated and feared margin calls apparently have kicked off in Q4. During the blistering stock market boom in recent years – part of the “Everything Bubble,” so called since nearly all asset classes inflated in unison – margin debt ballooned to $669 billion at the peak in May 2018, up 60% from the pre-Financial Crisis peak in July 2007, and up 117% since January 2012. Since the peak in May, margin debt has plunged by $114.6 billion. With a 20-year chart like this, the absolute dollar amounts are less relevant since the purchasing power of the dollar has dropped over the period. What is important are the movements, up and down, and how they relate to stock market events (white). As you can see in the charts above, my dictum, repeated on December 22 — “Nothing goes to hell in a straight line” — holds from a historical point of view as well. Plunges are followed by jumps. This creates a lot of noise. But added together over time, they form a trend. 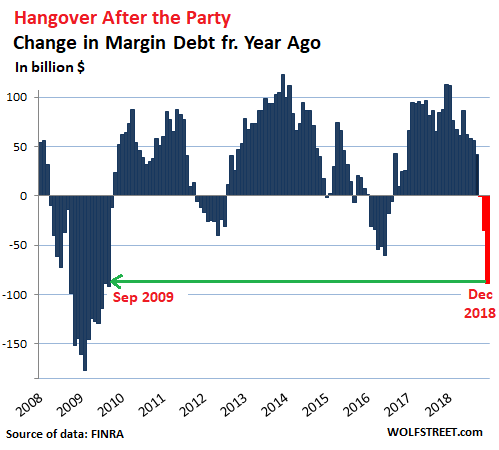 The rally since December 26 tells me that people are piling back into margin debt, and that when we get the January data, margin-debt levels will have increased. But this is how margin debt and the stock market feed each other: Surging stock prices give people the urge to pile in, and they borrow money to do so, which drives up stock prices even further. But when the rally ends and stocks head south in a significant manner, and when people are highly leveraged, they will unload stocks to pay down their margin debt, and some will be forced to do so, and this drives down stock prices further. It is this mechanism that links margin debt and the stock market – but neither is a good predictor for the other because one might occur before the other or simultaneous with the other. But they do move in the same direction over time. 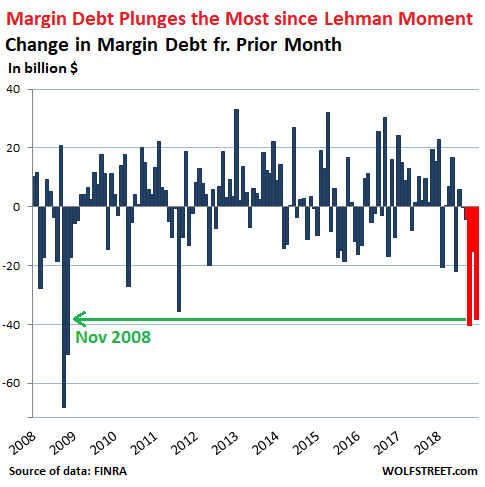 The plunge in margin debt in the third quarter took a chunk of margin debt off the table, but unwinding such a huge pile of stock-market leverage takes time, usually years, with many sharp interruptions in the opposite direction. I wonder what january looks like. As graphed : the Tower of Sauron ?? QE money flooded the financial market and the people who received that money went and bought other financial assets with it. Very low-interest, rates are also a huge contributing factor to the increased prices. The asset bubble you are seeing, in my opinion, has been going on for the better part of 40 years. Likely cause is the excess rise in private debt. Remember debt and money are the same things. Collectively we’ve taken on excessive amounts of debt which is simply somebody else’s asset. My guess is that there will be another banking crisis where banks are insolvent again which will lead to a currency crisis and massive deflation and repudiation of debts. The question is, can the central banks ease up off the gas slow enough to keep the economy coasting before the giant bubble bursts? Or will people panic, seizing up the engine like it did in 2008/9? It’s a great short-term fix, but we’ve been at it for nearly ten years. It’s hard to tell what shape the underlying economy is in after so many years of being propped up. If it does collapse its best to pile into cash? This all makes sense, but how do you account for Venezuela, which has experienced hyperinflation, not massive deflation (in fact, their stock market has increased at a phenomena rate as well, far exceeding all others, up 25% or even 30% on some days this month (they chopped 3 zeros off the Caracas index, too. This, incidentally sheds light on the fact that rising markets do not always correlate with economic growth- the same was true in the Weimar Republic, and can even hide decreased production of goods, though today’s news, if it can be believed stated output was up in the U.S. Worthless contracts (no rule of law) and a population with no training or experience for their likely future. Venezuela population, according to the media, is trying to escape instead of retaking their country. No useful skills. The US dollar is worth less than 3 cents based on 1913 dollar. Not hyperinflation but not much store-of-value either. Inflation is a way to force productive people into approved investments. That is a very good question. What make the US respond differently than Venezuela? Basically, because the dollar is the world’s reserve currency because nobody ever thinks it could reasonably collapse in value – given the American capitalist system’s power and stability. The American military is the most powerful force ever assembled on Earth, and its entire duty is to protect capital. So, in terms of trade deficits, because the American dollar is very valuable in the global market, other countries will accept promises of money rather than immediate payment. For less stable and powerful currencies, this would be a risk. If I were to, say, promise 300 rubles to someone for a good, that person would likely be worried that the value of the rubble would decrease and that they would end up losing money on the transaction. This effect allows the U.S. to run fairly high trade deficits because people will accept promises of dollars for goods – so America can buy a lot of things. Also note that due to America’s ability to buy goods very cheaply (as a result of dollar hegemony), global financial growth is deeply tied to consumption in America. probably worth noting at this point that in the 70s OPEC made an agreement with the White House to sell oil only in dollars. This reinforced the value of the dollar and its place as a reserve currency, but it also created massive U.S. interest in controlling oil markets. What happened to the days of thrift? That is a good reply by Howard. I will add that the increase of money supply by the US and other westernised countries allows them to buy into developing world production where costs are much much lower. This is part of how manufacturing has disappeared from the west, to be replaced by service and welfare. Add to this the gains to productivity by new manufacturing process, and other efficiencies, and it shows why prices have remained acceptable. As Howard says this is part of dollar hegemony, where there are agreements by surplus countries to reinvest in the US treasury market and keep currencies pegged or relatively pegged, so allowing a circular flow of financial activity. China and Saudi are pretty much pegged, as are many other countries. Venezuela’s currency is subject to its reference to the US dollar, as imports are accounted in dollars by most suppliers. If Venezuela messes up its balance of payments, its oil production, or local confidence in its currency, it will show – simply put it doubles supply and its value halves both domestically and globally vs dollar. This is one reason gold is pledged as final payment and used to back up national currency or finance, it has a relatively common and stable value worldwide, and is understood as sound money. I would add, in a vicious cycle, it’s someone else’s non performing asset, or underwater mortgage. Hey Howard, I reckon you’ve pointed out the symptom and placed the timing very nicely. The cause, as I see it, is the energy situation. The late 70s/early 80s was by some measures when we hit peak easy conventional oil, and new sources since then have been getting ever less productive in energy terms, as in more energy input needed to obtain an equal energy output. Since we (unfortunately) don’t use KWh or something as currency we are able to create far more debt/currency/valuation than should be allowed, since a currency removed from the primary driver of the economy makes pulling wool over eyes and obfuscating the relationship between energy and economic activity a systemic property. And any person seeking political office of significance has to buy in or they will not advance. Since our system craves exponential growth forever we are going to be in for a very rude awakening, I reckon. I agree Salty. Replace nearly free energy with debt to buy more balls and keep them in the air. Barrels and bank vaults are cheaper than lithium ion cells. One of the important requirements for something being a good money is ability to store it without incurring large expenses. That’s why I avoided using the term ‘money’, and instead used the term ‘currency’. I would see energy units performing a better role than current currencies in the role of denominating prices on the stuff we consume or the stuff use for value storage. Such value storage could e.g. be debts/bonds also denominated in energy terms. As long as there is gas in the tank (currently 250 bps) the Fed has shown time and time again that it will cover the equity market. As soon as the gas runs out, there will be trouble. We are not at that point. I wish this was not the case, but this is unfortunately the way things are. It would be great to invest in equities based on fundamentals, but the last 30 years have been increasingly diverging from price discovery. It’s very difficult to invest new cash into this market knowing that it’s not based on fundamentals and the true value is far far less than what the artificial market is throwing at us. The value is at the whims and desires of policy makers who have their own agendas. The Fed once again illustrated last month that it is all to eager and ready to jump in at a moments notice. And this drop was relatively mild compared to the dot com and GFC. I hadn’t expected them to jump in so soon….. The margin behavior will not change as long as investors know the Fed is ready to put the market. Corporations, similarly, won’t deleverage in the face of truly persistent tepid interest rates. In capitalism, anything that CAN be exploited MUST be exploited. Banks slowly tested Glass Steagall until they were finally sure the act was toothless. When bailouts demonstrate that all normal consequences are toothless, any qualifying business must exploit that or be consumed by their competition. Have any of you considered that the US market is being kept afloat by the FED to buy time for the inevitable decline of the Chinese Economy. Just go back a few years when the talk was China would overtake the US in economic performance. Now slowly we are seeing the cracks in their armor. Defaults being allowed, restructuring of SOEs etc etc. The tune is mostly about how China will manage its debt with destabilizing. USSR was also strong until it wasn’t. After the breakup Russia went from 1/3rd of US economic power to 1/15th. “I’ve Abandoned Free Market Principles To Save The Free Market System”. There’s nothing wrong with capitalism. Its the safest system that allows creative destruction closest to the consumer level. Now can anyone please tell me who bought Treasuries this past two weeks? The yield dropped across most maturities. I did. Right now we are living off short term Treasuries, interest at around 2.5% . Some of our money is set to automatically reinvest in Treasury Direct. I’m not complaining since the last time interest was anywhere this good for safe investments was 2007. Are you sure he said that? Sounds way too sophisticated, subtle and self-aware for The Great Bumbler. I agree the Fed folded like a wet noodle. The Fred’s subsuvience was do quick, I now wonder if a larger decline occurs, will the Fed buy stocks and corporate debt, like governments in Europe do? The Fed is not allowed to buy corporate bonds and stocks. Congress would have to make that happen. This means financial conditions are tightening quite a bit. And if the Fed doesn’t want to bring the house of cards down all at once, it’s a good idea to be careful at this point. Also, you’ve got to understand the difference between a “pause” and “rate cuts.” They’re not the same thing. Rate cuts are NOT on the table. With this economy, as it is currently, rate cuts are off the table. The economy would have to deteriorate quite a bit first (it will eventually, but not yet). But does the Fed not fund the “Plunge Protection Team” (PPT), aka the “Working Group on Financial Markets”? Or are you distinguishing between buying stocks and futures? The “PPT” is kind of joke that is being thrown around all the time to explain sudden market jumps, but not to explain sudden market drops. There is no PPT that buys or sells stocks. Don’t take semi-jokes like this seriously. But algo-driven trading by hedge funds and other asset managers does exist, and in fact, it totally dominates stock market trading. Wolf has a good read on this, the PPT is no longer a factor, however the Fed is the banker to the government (all of it) of the United States, and anyone with the keys to the basement at ME could use their trading desk. That we know is real. The point of the Christmas Eve Massacre? begun by official suggestions by Mnuchin, directed at the Fed, did result in the rally we have now. The stock market is a matter of national security, read Jim Rickards on that. There may be other three letter agencies with their fingers on the keyboard. Thanks Wolf, but I remain confused. Are you suggesting that the WGFM does not exist? Or that it does, and does not intervene in markets? Was Reuters making up things out of whole cloth on December 24th when it stated recently that “Treasury Secretary Steven Mnuchin will host the call with the president’s Working Group on Financial Markets, known colloquially as the ‘Plunge Protection Team.’ “? You were asking about the Fed’s PPT, which is what I answered. But now you throw in Mnuchin. He is head of the Treasury Department, not the Fed. These very different entities. The Working Group on Financial Markets (WGFM) is another entity yet again. It reports to POTUS. Its main function is to study issues and produce reports on how to solve certain financial problems such as, perhaps most famously, the money-market problems that arose during the Financial Crisis. It released its money-market reform proposal in 2010. Right, Wolf, it’s complete serendipity that Mnuchkin meets with the Presidents Working Group (which includes the Fed Chairman) and the CEO’s of the six largest banks in the US… and the market goes on to stage a rally, recovering almost 50% of its decline in what, 20 trading days? That the market is over-represented by a very small population of ‘traders’ should be incontrovertible. To insinuate that hedge funds and algos are responsible, or even capable, of propping up the market or staging a rally of this magnitude without even the slightest resistance is a farce. No one, aside from sovereign funds and central banks , is able to provide the unlimited liquidity that the market requires to continue to float and sustain this flagpole rally. Mostly good reporting here but let’s not be afraid to face the reality of who is actually in control of this market – and it isn’t hedge funds, the kings of swing, and algos who are quite literally bottom feeding nano-second exploiters. Large trading desks funded by unlimited liquidity are to blame here, and of those, there are only a few. Look, even I predicted the surge in the stock market. It was so obvious that even I could see it coming, after the brutal sell-off. That’s why I wrote the article on Dec 22 that “nothing goes to hell in a straight line.” This just doesn’t happen. After a sell-off like this, there almost always is a bounce. BTW, Wolf, your enlightening, pragmatic articles are very much appreciated, but I’d like to also thank you for so often taking the care to quickly explain requisite foundational concepts. It’s very much appreciated. No, the Fed has not stopped QT. It’s still on automatic pilot. Fed balance sheet run off has significantly slowed down since late November per their data link below (select 3 month time line, compare $39B drop from Nov 14th to Nov 21st, compared to $6B this past week). Could this have driven more volatility in early December 2018? Could the slower run-off be helping lower volatility in January 2019? Global central banks replaced economic cycles with liquidity cycles. Global QE has by far been the most powerful liquidity driver, along with other bank and TBTF corporate bailout mechanisms. Thus QT is the real hidden monster…and it is STILL on auto-pilot (yet various greatly week to week due to valid reasons). Seems to me that margin, stock buybacks, PPT, etc only enhance a bull or bear market as secondary drivers. I hate it when people make these clueless misleading comments about the Fed’s balance sheet right here on my site without having read a single syllable of what I have written about the Fed’s balance sheet. So here is my latest — Please force yourself to READ it all the way down, and understand it all the way, before making another clueless misleading comment about the Fed’s balance sheet. Click on the T-notes and T-bonds tab and add by month. The sum of each month up to 30 billion is the scheduled roffoff. It’s only less than 12b for end of January, so this month nothing has matured yet. Usually it the previous month before the meeting that has a press conference that is big. So expect massive reivestments on February, May, August and November. If there is one thing Wolf has inspired me, it is to look at the raw data and do the math. The news can be deceiving. Wolf, out of curiosity, do you know what maturity of the re-investments for the portion above $30B is? It would be interesting to know how far they are pushing those out. The Fed is not “pushing” anything out. These Treasuries roll off on “autopilot” when they mature. The Fed publishes the maturity schedule, and you can find out in advance what amount of Treasuries mature. Iamafan above has answered your question and supplied the link and instructions for the Fed’s maturity schedule (thank you, Iamafan). In other words, there is not a lot of “re-investment” going on. The last month maturities exceeded the roll-off cap was November. There will be some in the future, but fewer and fewer as the balance sheet winds down. The Fed is actively discussing what its balance sheet should look like after QT is finished. We don’t hear much about these discussions except that they’re going on, and some vague directions. For example, right now the thinking seems to be that there should be no MBS left on the balance sheet, only Treasury securities. And also it seems the thinking currently favors switching more or all of the balance to short-term bills (there aren’t any right now) rather than longer-term notes and bonds. I agree Wolf has the ability to inspire. He seems to have a love for the subject, and I personally like his “freedom is wealth” lifestyle, perhaps because that is the prescription that has worked best for me and most of my close friends. I also agree running the numbers leads to the truth. The real trick is when to ignore real world reality (truth), and instead follow the herd mentality (perceptions). For example, back in 2011 when the mark to market accounting rule was changed to mark to fantasy, a investment friend (economist/accountant) called me immediately and was freaking out about the reality of the change…said it was not fair, he was buying gold coins, the system would fail, etc. I told him logic dictates that if the rules of sports are changed mid season, you simply follow the new rules…as such the banks are now saved (perception) as the rules to the banking “game” has changed. I bought a boat load of out of the money calls for a couple of TBTF banks for a couple of pennies, which created ludicrous gains in a few short weeks. Running the numbers would not have helped, and reality would have only freaked me out along with my somewhat tunnel visioned friend. New rules, new game so think outside of the box and get creative. I am now studying the fed and brainstorming what new new rules they will need to enact to counteract the bursting of the “everything bubble”. Previous feds have already dropped many ideas over the last few years, and other countries have already experimented…so it really comes down to narrowing down the timing, which is never easy with so many continuous central bank interventions on a global scale. So that assumes you think this is the beginning of a secular bear market then. Looks like gamblers borrowing from a loan shark on the way to the casino. They never learn. Well they believe it’s a no-lose bet because if there’s strife in the stockmarket, there will always be the socio-capitalist backstop of money printing in order to prevent a downturn. So reckless consumption/speculation accelerates – and it makes politicos look good, because they can crow about record-high stock markets and lots of [crappy service] jobs, without having to do any real work at all like forming industrial/scientific strategy aside from how much to spend on weapons of war next year (the answer: always “more”). What a bizarre way to order humanity. Thatcher described socialism as ‘spending other people’s money’ which now appears utterly risible and deeply ironic given the amount of ‘other people’s money’ that has been created out of thin air and then showered onto people working in the finance sector who strangely refer to themselves as ‘free market capitalists’. Very true MD. And very sad. This is why there’s so much societal cynicism. It’s increasingly worse. Everyone knows the game, and everyone is on edge because it’s not rooted in fundamentals and price discovery. Every time Ive purchased equities in the last 5 years, I feel buyer remorse, not because the price drops but because I know I’m paying more for the item than it’s worth. This wasn’t the case 20 years ago…..
Opps…lack of focus and got my date wrong. Mark to market accounting was changed to mark to “messy” in 2009, not 2011. Margin debt, personal debt, corporate debt, national debt, credit cards, have you fallen in love with debt yet? Debt is a tool and like any tool when used improperly can cause harm. Debt used to increase productivity, or buy physical assets are typically a positive, debt that is used to gamble, consume services, or purchase perishable goods typically a negative. Just imagine if everyone insisted on actually holding their own physical assets rather then playing the debt game. As I walked to the dumpster with my weekly trash I looked around at the vast majority of cars and most all of them are less then 5 years old. All of my neighbors are still paying on their homes. I think it would be safe to say the vast majority of Americans have some form of debt. Then I look at the news and hear stories of federal workers who are missing just a paycheck or two and are struggling to put food on the table. Are we really living in an age where a month without pay will possibly send us into starvation? I think the entire system has been on the verge of collapse for at least a couple decades but the banks/FED simply cannot allow it. I wish I had the answer to solving things or reversing the trends we have adopted. I can only answer for my individual self and encourage others to invest in real world things of value and do so with money you have available without taking debt to do so. I’ve recently played the metals game because when the paper burns as it has in many countries over time the only thing that will retain it’s value is the metals. Metals: Silver and Gold, combined, have a compounded annual growth rate over a 30-year span, of -.3%. The DOW has a 30-year compounded annual growth rate of 7.2%. The Russell 2000 has a 30-yr. CAGR of 7.7%. So, seems to me, that unless you can time the market on precious metals, you’re going to make a lousy investment. Like most detractors of PMs, you are looking at them through a blinkered, USD lens. For those living in many other countries in the world, gold has played its long-standing, historical role of preserving wealth. And speaking of “timing”, you are cherry-picking to suit your argument. What was the annual growth rates of those indexes if calculated soon after the tech crash, or ’08 crisis? What would the return on gold have been given a 20, rather than 30 year time frame? You missed the most important aspect. Fiat currencies fail as history has proven many times, gold and silver has never failed and gold is easily traded to any currency. America may think itself immune to such issues but in reality our military power allows us to get away with things on the world stage that many countries simply could not. Russia and China are not going to accept a currency reset to a global currency or whatever other ideas the US may have planned to escape this fiasco. China being the biggest threat, but both are ramping up their military spending and will challenge any attempts at the US trying to escape this debt so I’ll gladly hold my gold knowing it can be swapped for most any currency or goods I may need in the future. In 1933 FDR made gold illegal and offered $20.67 per ounce. In 1970 before Nixon took us off the gold standard gold was $35.00 per ounce. Given the world debt of 250 trillion dollars gold should be much more expensive if the debt was actually backed by gold. The day of reckoning will come. The last bull market in stocks ended around 2000 what should have been obvios by 2001 or so. That was a signal to look at gold where some long-term bottoming happened. Investing in gold and silver around 2000 beats stocks since then. The S&P was about 1500 in 2000 and closed 2670. Gold went from below 300 to over 1200 now. The first part of the precious metals bull market was over when silver failed at the old high of 50$/oz. Eric – the average American has zero savings and practically a negative amount of financial savvy. I just loaned $400 to my boss, I, making $15k a year and he making 10X as much. I told him he should try to keep more “float” in his account and he said something like, ‘Yeah, I know, but the holidays….” (said holidays included a vacation in Italy). As for myself, it’s only in my 50s that I’ve started to get hard-nosed about saving money and having some “float”. how does the margin debt chart look with a log scale? That would show the relative movements from top to bottom better then the linear scale. 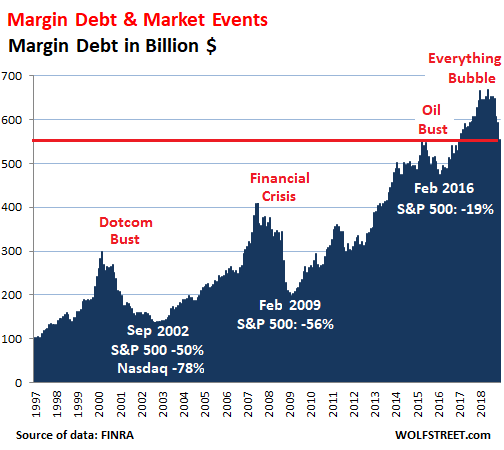 The dotcom bust and the financial crisis show both that the margin debt went to about half the peak level. Compared to that the current move (~20%) looks rather small, something like the oil bust move that did not end the bull market in stocks. Yes, correct, the current move is substantial but not nearly on par with what happened after the dotcom bust or the Financial Crisis. I remember the days when I got caution emails from Schwab about using margin, and other emails setting restrictions on margin. At the time, I thought it sounded like a nervous nelly parent cautioning drinking kids to slow down a wild keg party. Why the caution? Things are great! That was late 1999. Being young and foolish, I stated dumping money into the subsequent market drop, resting confidently on the fact that most bear markets last only 14 months. Boy, have I learned a lot since then. A lot has changed about margin since 1929, and 1999, but the folly of investors has not. Seems as though every generation, needs a re-education by learning the hard way, but margin restrictions have led to lesser disasters over time. 3.) Free Credit Balances in Customers’ Securities Margin Accounts. While #1 – Debit Balances in Customers’ Securities Margin Accounts – has come down to $554,285 (in mil.) for Dec 2018, #3 – Free Credit Balances in Customers’ Securities Margin Accounts. – has gone up to $190,743 (in mil). I wonder if you can explain these two other measures to us? How do these Credit Balances matter in the whole equation? I’m not sure FINRA’s credit balance data is meaningful because a lot of brokers have separate entities that are FDIC-regulated banks, and they either sweep extra cash into the FDIC-insured linked bank accounts or encourage their customers to transfer the money themselves. And so they disappear as a credit balance from the brokerage account. That’s what my broker does. The reason for this is that cash in a brokerage account is not FDIC insured, and if the broker fails, the cash has no deposit insurance. I keep next to zero cash in my brokerage accounts for that reason. In addition, people park cash in high-yield savings accounts that are not with the broker, or in Treasury bills at treasurydirect.gov, etc. So this credit balance data published by FINRA might only reflect a small portion of the cash or cash-like instruments out there that is essentially and on short notice available to trade. Rule 4521(d) requires that a member must only include free credit balances in cash and securities margin accounts in the report. Balances in short accounts and in special memorandum accounts (see Regulation T of the Board of Governors of the Federal Reserve System) are not considered free credit balance. According to Regulation T, an investor may borrow up to 50% of the purchase price of securities that can be bought using a loan from a broker or dealer. The remaining 50% of the price must be funded with cash. That said, purchases on margin really is only 50% on margin since the rest needs to be funded in cash. In addition, Reg. T also prohibits free riding. In this case, the investor’s broker must freeze the cash account for 90 days, requiring the investor to fund securities purchases with cash on the date of the trade. Defined as: Because it takes up to two days for securities transaction to settle and the cash proceeds to be delivered to the seller of securities, a situation can arise when an investor buys and sells the same securities before paying for them from his cash account. I wonder what is the real effect of margin accounts given this info. Usually the devil is in the details. Remember gentlemen and gentlewoman, there are still gonna be rate hikes this year, think is only be two if that makes you feel better but the fact is that we don’t know since it depends on how things will go this year. Wolf, are you gonna write something about the government shutdown or are you waiting to get more data about it? I was not going to write about the government shutdown because they normally just blow over. But this one, the longest in history, is stuck, it seems. This is having all kinds of consequences, as we hear daily in the media, some of them minor but overblown, others not so minor. But there is another consequence we’re not hearing about: A lot of the government data about the economy is not being produced (some data is, including from the Labor Department). Normal people might not notice it as much, but I look at this data every day, and now much of it isn’t there. So we’re flying with our eyes partially closed. That’s OK for a few weeks, but if this lack of data drags on for months, it’s a problem because we don’t see the signs we normally see. And when suddenly, after the government “re-opens,” the data reappears, it could be very different than expected, and we might be in for some surprises, which is never good. Hmm could the lack of data be behind the stock market rally? We didn’t shoot the messenger we just shut them down? Much like Apple not giving quarterly guidance? No news is good news? Living in Washington DC I can tell you that there is a dramatic impact on the economy caused by the shutdown. People’s nerves are shattered. The homicide rate has shot up to double last years. 800,000 government workers are missing paychecks but are forced to go to work and incur the expense of doing so. Contractors outnumber government workers and they are not getting paid. They will never get reimbursed for the lost wages. Its as though unemployment shot up to 15% overnight. If this goes on for another month there will be riots. You can put that in the bank. Monitor the AAR reports- rail activity is a pretty good anecdotal pre-indicator for real world economic activity. The car loads are pretty revealing. Adam, this is actually a very good question. I also had the same question months ago so I googled the Fed for the answer. They said that the SOMA re-investments are made on the same proportions of the coupon securities in their balance sheet. As you can see the majority are in 3Y, 10Y, 2Y, 30Y, then 5Y securities in that order. Whether this is actually same as the proportions they hold? You can add up the balance sheet and compare the two.